MP CM Shivraj Singh Chouhan wasn’t eating meat ! The viral image is edited/photoshopped. the content in the plate from which he is eating added digitally. 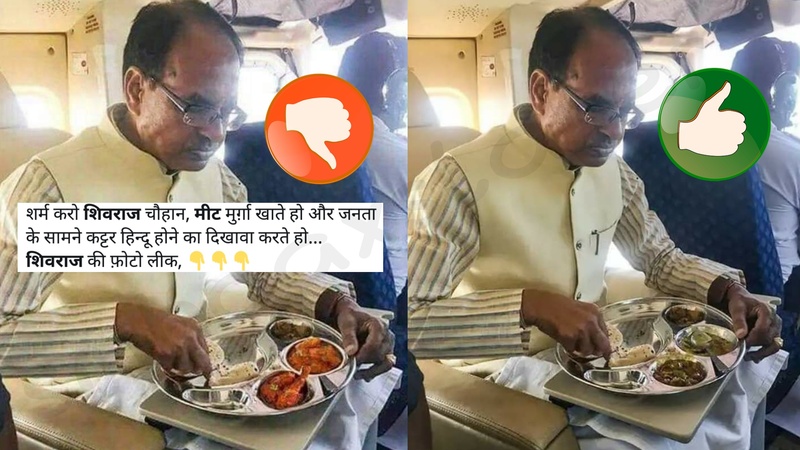 In the midst of the flight, Chouhan had a neatly packed home-cooked lunch and also shared the same with fellow passengers. The chief minister, who remains in campaign mode 24×7, read points of the speech to be given and took a quick nap to give rest to his throat. Soon after, he woke up to ask the pilot how much time was left to reach the next destination. There is hardly any time for a proper sleep when the election campaign is in full swing, said his accomplices. A Photoshopped image of an empty chair is viral. Did a Chinese army officer thrash a Muslim Uyghur for owning the Quran? January 5, 2019 Amruta Khandekar Comments Off on Did a Chinese army officer thrash a Muslim Uyghur for owning the Quran? Fake survey under name of BBC claims BBC published Congress on 4th most corrupt Political Party in the world.